Based on the discontinued Grizzly 450, the Kodiak features new styling and a laundry list of upgrades providing a dramatically improved riding experience. With the base model retailing for just $5,999, it’s actually $400 less than the base model, 2014 Grizzly. Yamaha’s Kodiak 450, where mid-size maneuverability meets full-size comfort at a bargain price. 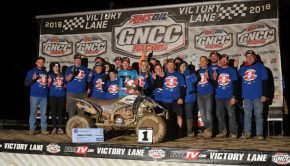 Two years ago, Yamaha streamlined their 4×4 ATV lineup in an effort to reduce manufacturing costs and increase value for their customers. The Grizzly 350, 450, and 550, discontinued after 2014, were replaced with variations of two new models sharing the Wolverine 700 UTV’s 708cc engine. First, there was the totally redesigned Grizzly 700. 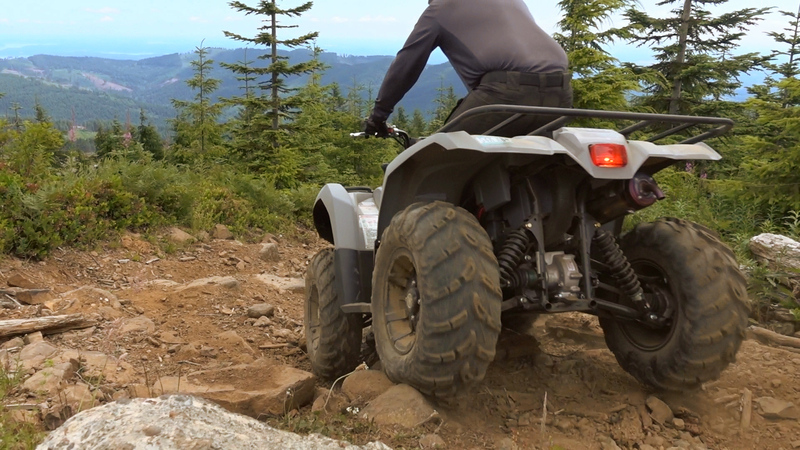 Built for aggressive trail riders and explorers, the Grizzly still retained all the attributes needed to get work done. 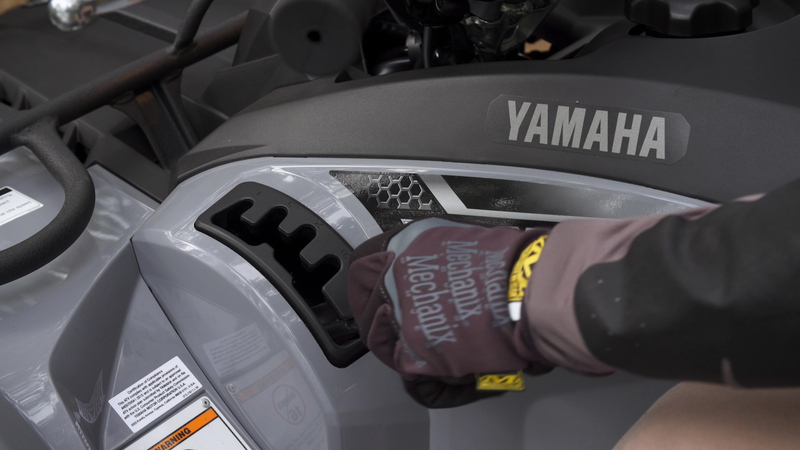 Yamaha saw no need to replace the Grizzly 550, as producing a smaller displacement version of the same engine doesn’t offer significant cost saving for them or the customer. The other new model for 2016 was the Kodiak 700. 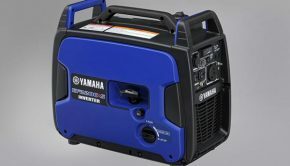 This model was designed for working and hunting first, while offering consumers a tremendous value in a trail machine. With the base model starting at $6,999, its price rivaled many competitors mid-size 4x4s, while packing a full-size chassis and large displacement engine. 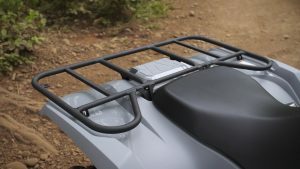 Seeing the demand for a mid-size ATV created by working applications and riders of various sizes, Yamaha did a good job of giving the full-size Kodiak a mid-size feel by lowering the fenders, seat height, and using a lower bend, more swept back handlebar. 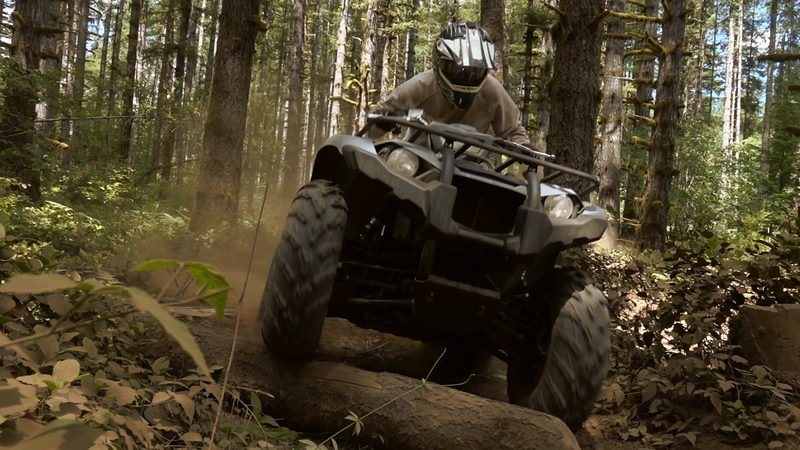 The Kodiak was well received by the public, and rapidly became the number one selling big-bore 4×4 ATV on the market. Based on Yamaha’s customer feedback that we saw in a number of your comments, there was still a demand out there for Yamaha to build a true mid-size 4×4 with a mid-size engine. 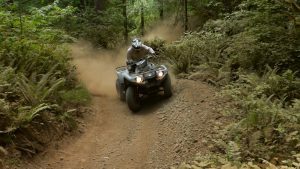 Just two years later, Yamaha has met those demands with the release of the new 2018 Kodiak 450. The new Kodiak is based on the discontinued Grizzly 450. The Kodiak features new styling and a laundry list of upgrades providing a dramatically improved riding experience. With the base model retailing for just $5,999, it’s actually $400 less than the base model, 2014 Grizzly. 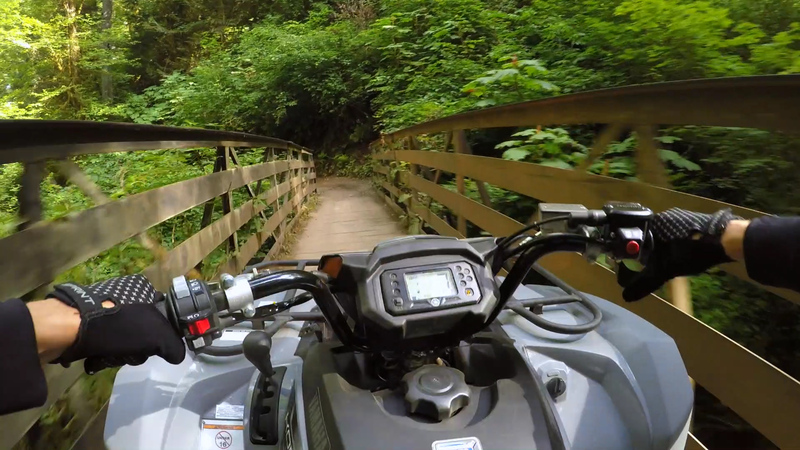 At Yamaha’s request, we traveled to Olympia, Washington for a hard day’s riding on the EPS-equipped version of the Kodiak in Capitol State Park. The beautiful, scenic terrain provided a ton of tight, twisty, rock and root-infested trails with some high-speed gravel road sections. This was the perfect place to get a feel for the new 450. The Kodiak is powered by Yamaha’s proven two-valve, single overhead cam, 421cc, water-cooled, four-stroke engine. It enjoys the addition of a Yamaha Fuel Injection system featuring a 34mm throttle body. The Kodiak is powered by Yamaha’s proven two-valve, single overhead cam, 421cc, water-cooled, four-stroke engine. It enjoys the addition of a Yamaha Fuel Injection system featuring a 34mm throttle body. The top-end is mated to Yamaha’s Ultramatic CVT style transmission, which features high and low ranges plus neutral, reverse, and park, selected by a smooth operating, gated shifter. 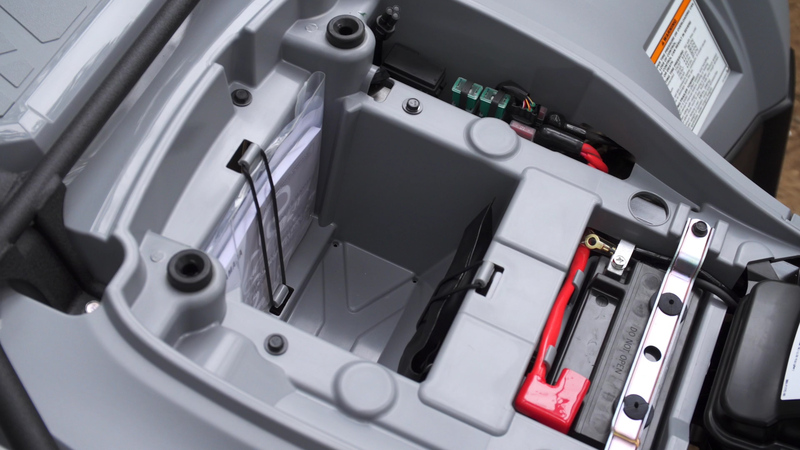 The transmission utilizes a centrifugal clutch to handle engagement providing constant belt tension for reduced wear. The Kodiak’s transmission uses 18 gram clutch weights compared to the 14 gram weights on the old Grizzly. This reduces RPMs at lower speeds to improve fuel economy, reduce sound output, and smooth power delivery. Switching back to the Grizzly’s 14 gram weights will add a bit more snap at lower RPMs should you desire it. All Kodiak 450 models feature Yamaha’s push-button, On Command two-wheel-drive and four-wheel-drive. There’s no differential lock on either model, a concession that Yamaha made to keep the price down. Yamaha’s Ultramatic CVT style transmission, which features high and low ranges plus neutral, reverse, and park, selected by a smooth operating, gated shifter. With our ride day starting out at 68 degrees, the Kodiak fired right up with no hesitation and was ready to go. Power delivery is linear and very controllable. While it’s not a wheelie machine, the engine pulls well right off idle producing good, usable torque at low RPMs. You can crawl up some pretty impressive inclines without revving the guts out of the engine, improving control and rider confidence. While you may want to shift into low-range for some sections, being able to leave the transmission in high and torque your way up rocky climbs helps maintain traction without the fear of burning up the belt. The engine pulls well right off idle producing good, usable torque at low RPMs. You can crawl up some pretty impressive inclines without revving the guts out of the engine. The upper midrange surge comes in handy when you pick up the pace of tight, twisty trails; the trail opens up; or you’re trying to build speed on prolonged climbs. Power builds smoothly entering the midrange delivering a broad, mellow, surge of power before entering the top end where the engine continues pulling pretty decently for its torquey two-valve design. The upper midrange surge comes in handy when you pick up the pace of tight, twisty trails; the trail opens up; or you’re trying to build speed on prolonged climbs. Yamaha absolutely nailed the fuel injection mapping. In spite of ever increasing emission standards, this engine runs incredibly well with zero hint of hesitation or popping at low RPMs. The transmission offers smooth off idle engagement without being sluggish. Engine braking feels natural and manual transmission-like at all RPMs, delivered to either two or four wheels depending on which drive mode you’re in. It aids control on downhills and descents without feeling overpowering. We shifted in and out of four-wheel-drive on the move as trail conditions demanded. We never found ourselves wishing for front differential lock in the rocks, although we tested in nearly completely dry conditions. Riders who demand diff lock will need to consider stepping up to the Kodiak 700 EPS. We shifted in and out of four-wheel-drive on the move as trail conditions demanded. We never found ourselves wishing for front differential lock in the rocks, although we tested in nearly completely dry conditions. Complementing the longer A-arms are new, longer, gas changed, five-way preload adjustable shocks. The Kodiak featuring 6.7” front and 7.4” rear. Complementing the longer A-arms are new, longer, gas changed, five-way preload adjustable shocks. 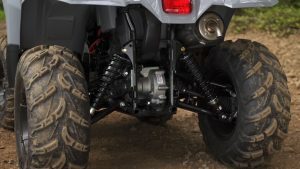 Suspension travel has been increased 4/10” front and 3/10” rear compared to the Grizzly 450 with the Kodiak featuring 6.7” front and 7.4” rear. With the added width for stability, Yamaha worked to soften the shocks’ initial travel, while increasing their bottoming resistance. 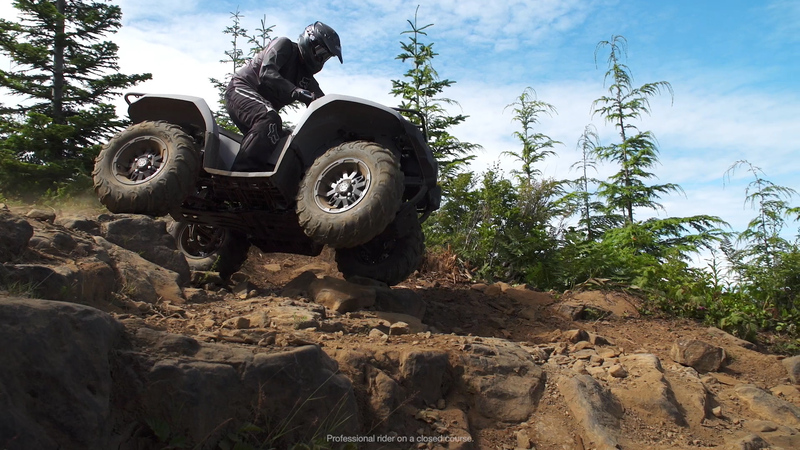 Softer suspension settings made Yamaha less dependent on using a lightweight, highly flexible tire for small bump absorption, letting them utilize tougher, four-ply tires from CST. While some manufacturers are using 24” tires in this class, Yamaha stuck with taller 25” tires mounted on 12” wheels all the way around. Our EPS test unit uses cast aluminum wheels while the base model uses steel wheels. According to Yamaha’s specs, compared to the old Grizzly, the Kodiak is 3.5” wider at 46.5”. It has a .3” longer wheelbase of 48.8”. Sitting a bit lower in its suspension travel, ground clearance is down a bit from 10.8” to 9.6”. Fortunately, the frame is protected by a full length skid plate. Seat height is up a half inch at 33.6” as is the machine’s overall height, up 1.6” to 45.7”. 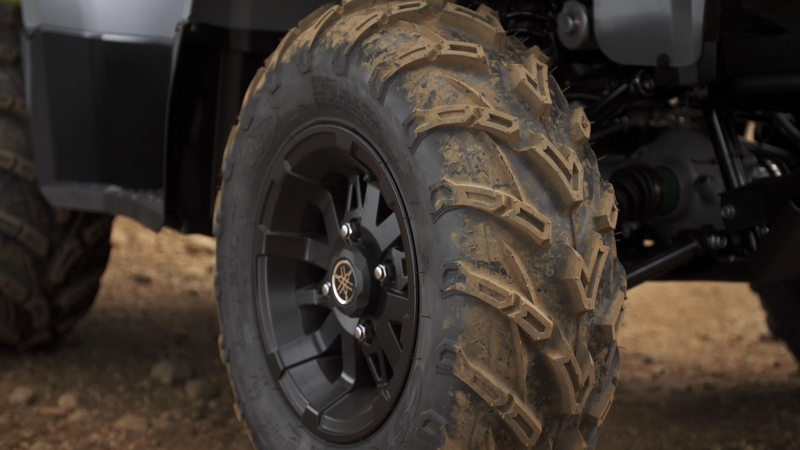 Between its four-ply tires, chassis, and suspension upgrades, the Kodiak gained around 30 pounds with the EPS model’s claimed wet weight of 650lbs. Compared to the ergonomically shrunk down Kodiak 700, the 450 is a little shorter, lower, and more compact in nearly every way with the exception of its track width. The Kodiak 450’s chassis and suspension are beautifully matched to its engine. Based on our initial impression, it’s the best handling mid-size ATV we’ve thrown a leg over! What’s most striking is that this is the only mid-size chassis ATV we’ve ridden providing a plush ride on par with some full-size machines. 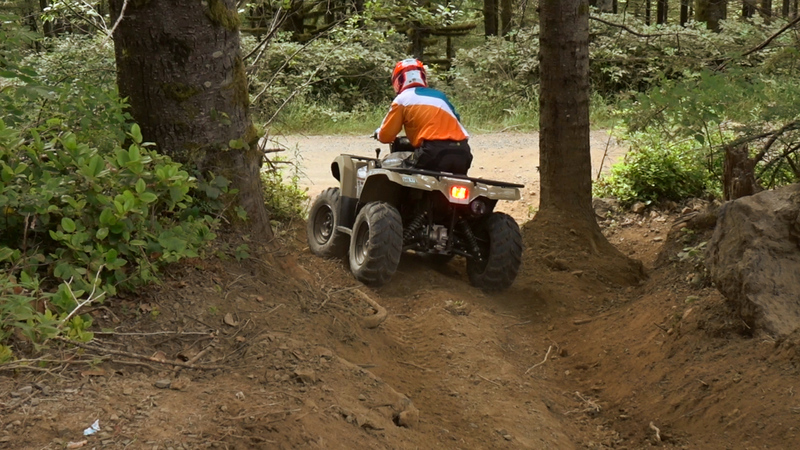 With very limited time on an old Grizzly 450 several years back, the ride of the Kodiak is undeniably better. 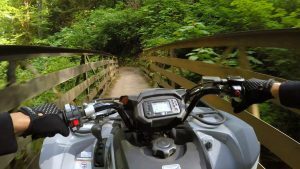 With the stock suspension settings in the second preload position, small abrupt impacts with roots and rocks never transmit a harsh sensation to the rider. It’s all-dap plush and we love it. 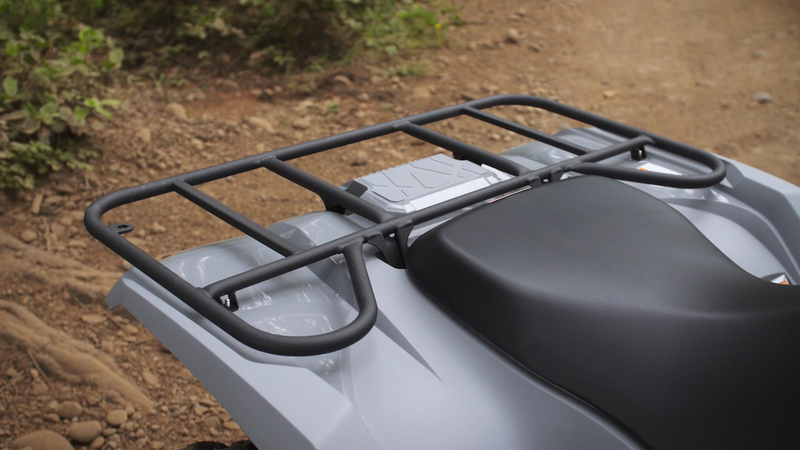 What’s most striking is that this is the only mid-size chassis ATV we’ve ridden providing a plush ride on par with some full-size machines. 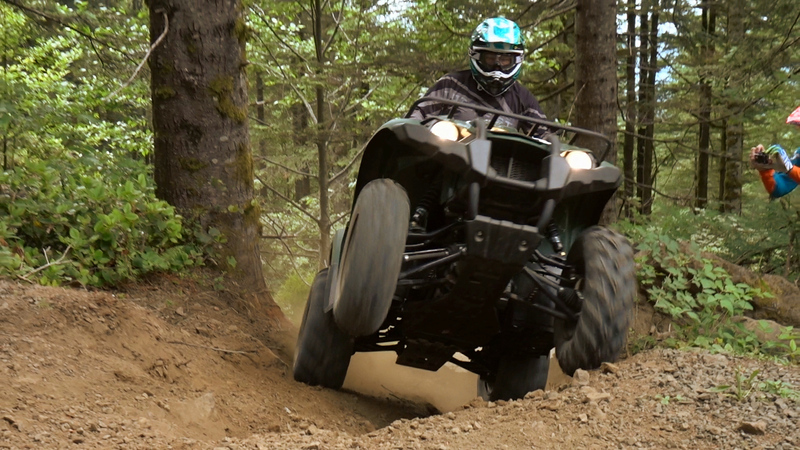 With less travel, the Kodiak doesn’t hold up to big hits quite as well as the longer legged Grizzly 700. 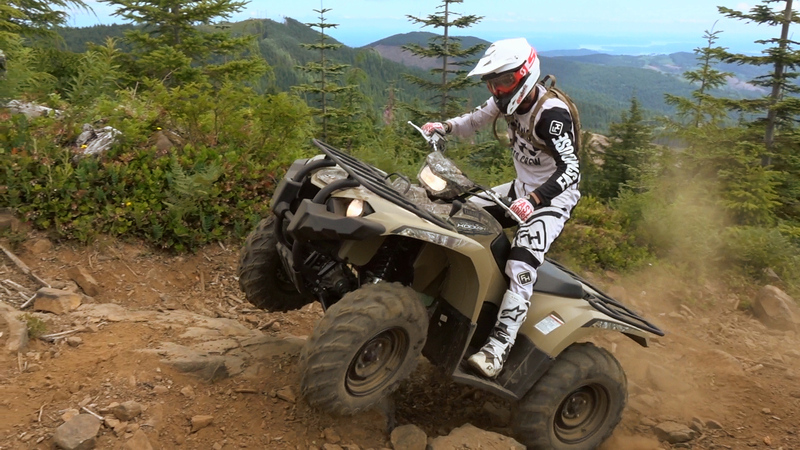 With less travel, the Kodiak doesn’t hold up to big hits quite as well as the longer legged Grizzly 700. You’ll find the limits of the front suspension a little sooner than the back on jumps and g-outs. Rolling or manualing through whoops works best. If you try and blaze through whoops, things get a little hairy. See the Raptor 700 for this type of riding. 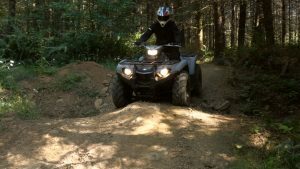 The added width of the Kodiak 450 gives the machine a sure-footed, planted feeling in the tight, twisty stuff and on off-cambers. We noted a little front-end dive entering corners at high speed. Adding a notch of preload to the front shocks reduces high-speed body and balances the ride nicely on bigger hits without detracting from the plush feel. The added width of the Kodiak 450 gives the machine a sure-footed, planted feeling in the tight, twisty stuff and on off-cambers. Steering is accurate and responsive, making the 450 easy to maneuver through tighter sections while providing a stable confident feeling at higher speeds. Steering is accurate and responsive, making the 450 easy to maneuver through tighter sections while providing a stable confident feeling at higher speeds. The CST tires provided very good traction in the mostly dry, sometimes rocky, and gravel surfaces we encountered. Similar in design to an ITP Mud Lite, we suspect they will be decent performers in the wet as well. While we were initially concerned about the small loss in ground clearance, it didn’t appear to be an issue. We only framed out a couple of times, but never became hung up. Overall, we think Kodiak 450 will go more places with less effort than the old Grizzly. Dual hydraulic disc brakes up front and a sealed multi-disk wet rear brake slow the machine. The sealed rear brake is designed to last the life of the vehicle eliminating maintenance. The front and rear brakes are independently operated by the handlebar mounted levers and right side, floorboard mounted, rear brake pedal. We came away happier than expected with the overall braking performance. Braking performance is well matched to the vehicle. We came away happier than expected with the overall braking performance. Braking performance is well matched to the vehicle. They offer good stopping power without being overly sensitive. We typically complain about the feel of sealed rear disc brakes, but we didn’t experience the usual disparity in feel and performance between it and the typically far superior front disc brakes that we’re accustomed to. Ergonomics were good for our 6ft tall test rider. It’s comfortably narrow between your legs. The handlebars are well within ready even at full lock, and the fenders never seemed to get in the way when hanging off the side. In spite of the unit’s smaller size, Yamaha worked to open up the cockpit improving comfort and control. They accomplished this by moving the front fenders forward and the rear fenders back. The floorboard area was made 1.57” wider and 1.38” longer. The seat was made 4” longer along with using a taller handlebar with more sweep. A new thumb throttle lever is 15mm wider and 7mm longer moving it closer to the grip for easier reach while reducing effort. There’s also a new handlebar mounted light pod on the EPS models with a new, closer mounted digital instrument display featuring a function to track service intervals for oil changes, air filter maintenance, etc. Ergonomics were good for our 6ft tall test rider. It’s comfortably narrow between your legs. The handlebars are well within ready even at full lock, and the fenders never seemed to get in the way when hanging off the side. The seat is plush without hindering movement. We’re pretty sure this machine will fit wives and big farm boys (16 and up) alike with easy reach and plenty of room to move. Perhaps a little taller, more aggressive peg would be good for riding in mud or snow, but there isn’t much else to snivel about. Steel racks work best for securing cargo. The Kodiaks can haul 88lbs front and 176lbs rear, in addition to towing an additional 1322lbs. Steel racks work best for securing cargo. The Kodiaks can haul 88lbs front and 176lbs rear, in addition to towing an additional 1322lbs. Compared to many larger and far more expensive machines, the Kodiak 450 will get a lot more work done for the dollar. We would like to see a little more on-board storage, though. We would like to see a little more on-board storage. 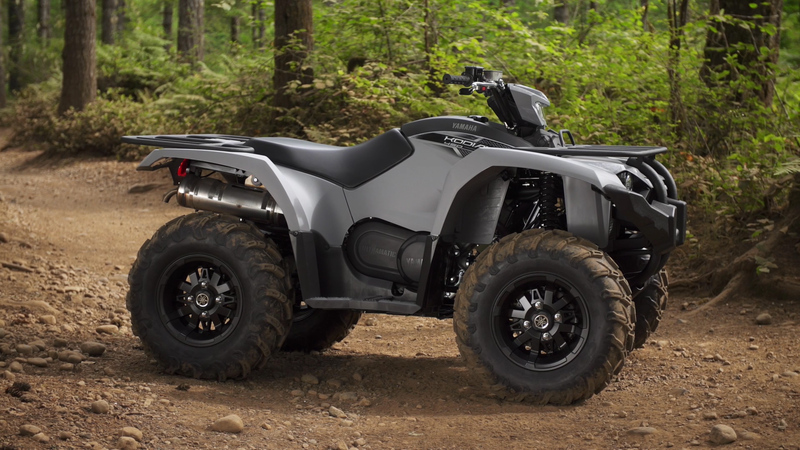 Yamaha has seemingly built a mid-size 4×4 ATV without compromise. While not a powerhouse, it’s powerful enough to tackle almost any job or terrain. 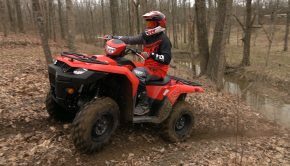 Delivering the more compact size many riders prefer, it’s the only mid-size ATV we’ve ridden that does so without sacrificing comfort and ride quality. At $5,999 for the base model and $7,199 for the EPS version, the American-built Kodiak 450 is already a pretty proven platform offering exceptional performance and value in its class. 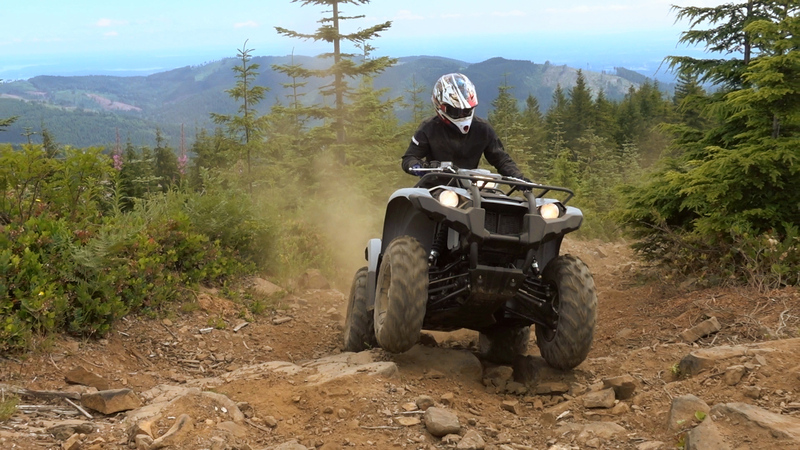 Delivering the more compact size many riders prefer, it’s the only mid-size ATV we’ve ridden that does so without sacrificing comfort and ride quality. 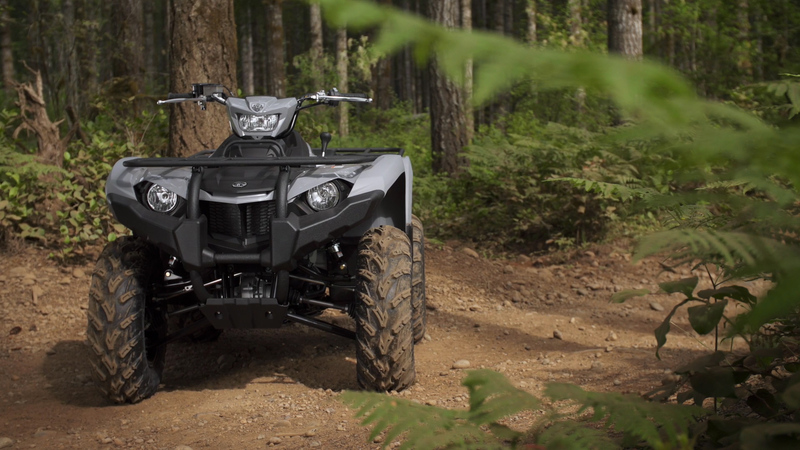 Summary: Yamaha has seemingly built a mid-size 4x4 ATV without compromise. While not a powerhouse, it’s powerful enough to tackle almost any job or terrain. 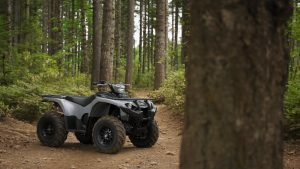 Delivering the more compact size many riders prefer, it’s the only mid-size ATV we’ve ridden that does so without sacrificing comfort and ride quality. At $5,999 for the base model and $7,199 for the EPS version, the American-built Kodiak 450 is already a pretty proven platform offering exceptional performance and value in its class.